Economical Model K comes standard with 15m of 12.5mm cable and 3 cleaning tools. Weighs only 23kgs. Cage can hold 30m of cable. Cable is certified music wire with genuine galvanised aircraft wire inner core for longer life. Large crank handle provides firm grip for easier turning. Nickel plated cable cage rotates freely on self aligning bearings. Thumb screw at front of cage anchors cable securely. 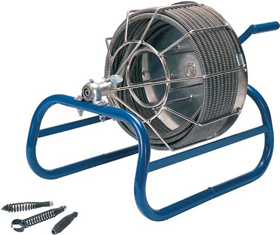 Heavy duty steel frame is reinforced on both sides with steel braces. 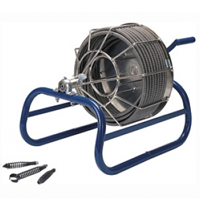 Economical model K comes standard with 50′ of 1/2″ cable and 3 cleaning tools. Weighs only 49 lbs. Cable is certified music wire with genuine galvanized aircraft wire inner core for longer life. Large crank handle provides firm grip for easier turning. Powder-coated cable cage rotates freely on self-aligning bearings. Thumb screw at front of cage anchors cable securely. Heavy-duty steel fram is reinforced on both sides with steel braces.